If there’s one thing about Estee Lauder that gets me, its their lipsticks. I don’t know why but there’s something comfortingly familiar about the fig smell and the ornate packaging that gets me every time. 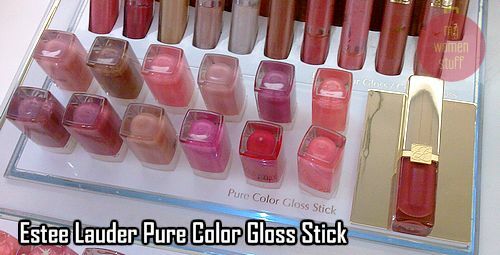 The newest product is the Pure Color Gloss Stick – a glossy lipstick. I’m happy to note that it is not all shimmer and shine but has a good amount of pigment to it. Pigment is important to me in lip products. It also feels light going on the skin. I only swatched 4 out of the 12 colors available because I was passing by an Estee Lauder counter and in a bit of a hurry. Clockwise from top left: Pop Pink, Orange Poppy, Sunlit Coral and Berry Pink. 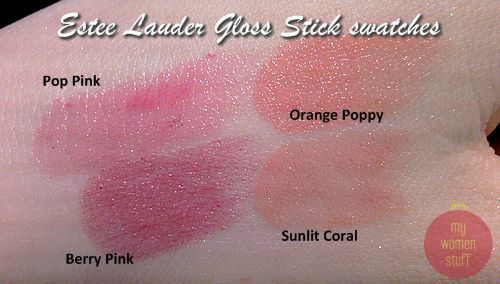 My faves were Sunlit Coral and Berry Pink – both my kind of shades! Orange Poppy just scared me with all that orange but I think it’d look amazing on someone with a darker or warmer skintone. Check out the rest of the colors on the Estee Lauder UK website. The colour applies very smoothly with nice shimmer as you can see. The color also is pretty much what you see in the tube which is nice. I like how the Pure Color collection is packaged – I can easily see the lip color I want just by looking at the case. Its May 1 today which means its Labour Day and a public holiday! Nice that it falls on Friday so we get 3 whole days off! What have you got planned? NEXT POST: A Giveaway to warm any Mother’s heart! estee’s lipstick feels a bit drying to me. do you have that feeling? will this have that drying effect? I’ve never had Estee Lauder lipsticks feel dry but I’ve spoken to people who’d had that feeling. I’m not sure how this one perfoms since I only swatched it. If i get it, I’ll report. I have the same crazy attraction to EL lippies! Maybe it’s also related to how I grew up with it cos my mom was a huge EL fan. 🙂 Will-re-sist-buy-ing-thissssss…. Labor day celebrated doing more labor! LOL 🙂 Enjoy your time off! and thanks for sharing the swatches! Ohh….I saw only 8 of the 12 shades here and definitely did not see the Orange Poppy. When I compared it to their website, I thought Sunlit Coral and Orange Poppy are actually the same colour with different names. Gotta edit the post in my blog now. Btw, I like Sunlit Coral(like you) the most of all the shades I saw the other day. Ohh… The orange poppy looks great. But the price…. I’m such a cheapskate… Hate spending more than SGD25 for a lipstick. Not to mention that here in singapore, departmental brands are waaaaayyyy over priced. I would like to tell you something too! Turns out, I’m not allergic to rice powder. When I tried the T.Leclerc powder the other time, I had something else on my face and it was the culprit! This time, when I went to try it again, no itch at all! I agree with you about the scent of EL’s lippies. The scent is one that reminds me of luxury, and I do not find it drying at all. Maybe it’s because I always prep my lips with lipbalm. I find the scent comforting heh… Perhaps because it was one of my first high end lippies!